Now, if you are going the traditional route, the contract is the holy grail. That’s why you’re doing all this hoop-jumping and twisting, and polishing your novel, and all those terrible query letters… that contract is the reward for all your hard, gut-twisting work. I can imagine that the idea can make your eyes glow with pride and happiness. Your feet probably want to dance, and you know, this is the dream coming true. That’s how I felt when an agent offered to represent me and sent me a contract to sign. Except it isn’t a dream coming true. It is one little step in your writing career, even though it might be one of the most important ones. And I’m telling you that you have to be prepared to walk away from it. Because no matter how much you like the agent or how much you like the editor, contracts are there in case something goes bad. And then, everything that is in the contract will be used. Against you. 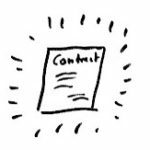 Kris Rusch has an excellent series on contracts, called Contracts and Dealbreakers. You should read it, whether you’re in the position to sign a contract or not. Read it NOW. Be aware of the traps. Always show the contract to a lawyer before you sign it. Because this is your career. And because neither the agent nor the publisher actually care about your career. Or even your books. You must protect your own career as author. There is nobody else to do it. And the most dangerous moment in your career is when you pick up a pen to sign that contract. A very, very dangerous moment. With a single stroke of that pen, you could sign away not just one book, but the entire world you created, your characters and even the name you’re writing under. For a pitiful allowance of a few thousand dollars. Unless you know what you’re doing. And that takes a calm and clear mind. You can’t make a good decision if you’re giddy with joy and drunk on success. Is this really a good choice? What are they giving me in exchange of my rights? How much marketing will they really do? How long will they own my book? Will I be able to publish elsewhere while under contract? Is the money really worth it? Is the validation really worth it? Could I do better as indie author? And don’t let the scope of work of an indie author scare you into signing. It isn’t that hard, nor is it that expensive. I want you to be very aware of what you are signing there. I don’t want you to regret what you did when you thought they were offering you the dream contract. So here’s some tapping to help you make a well-thought out business decision when that contract is offered to you. Even though I desire this contract more than anything in my life, I’m totally okay the way I am, and I now give myself permission to calmly and rationally evaluate how good it is for me. Even though this contract is all I ever wanted as author, finally my dream is coming true, I’m totally okay the way I am, and I now choose to check this contract for any hidden traps and dangers, and make a rational decision about signing it. Even though I really want this last step to crown my book and my work as author, I’m totally okay the way I am, and I now choose to be very calm and rational, and check this contract carefully with a lawyer before signing it. How do you feel about signing a contract? This entry was posted in General and tagged business, Contract, danger, expectations, The Publishing Author's Mindset, validation, writing career. Bookmark the permalink.